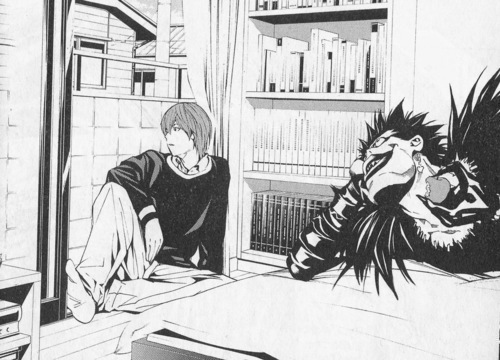 Kira and Ryuk. . Wallpaper and background images in the 死亡笔记 club tagged: photo ryuk light yagami kira death note. This 死亡笔记 photo contains 街道, 城市风貌, 城市环境, 城市场景, 城市设置, 标志, 海报, 文字, 黑板, and 文本. There might also be 客厅, 起居室, 前室, 前厅, 客厅里, 前面的房间, 客厅客厅, 报纸, 纸张, 杂志, 小报, 抹布, 纸, 外衣, 上衣, and 户外休闲服罩衣.